My love for art developed at a very early age, right alongside a love for animals. Growing up in a family where drawing was considered the default activity on a dreary afternoon - and in The Netherlands we had plenty of those - I filled many a sketchbook with drawings of birds, dolphins and various cartoon and comic book characters. After high school I chose the animals over the art and went to the University of Groningen to study marine biology. After earning a Masters Degree in marine biology I volunteered for a research project studying communication in Caribbean reef squid on the island of Bonaire. This is where I met my husband, Jim. We were often on the same shift to study the squid's behavior and after 2 weeks of working together we realized we were kindred spirits. After we returned to our respective sides of the Atlantic we remained in touch and a year later I moved to the US. It was around this time that I started drawing pets - my first pet portrait was a gift for my husband. One of the many things we share is a passion for animals and it wasn't long before we had surrounded ourselves with an interesting mix of pets. We now have two rescued cats named Tesla and Reese Cup, 2 sugar gliders, a 25-year-old green iguana and 3 old world chameleons. 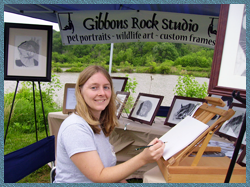 Art remained an important part of my life, but it wasn't until the summer of 2008 that I decided it was time to turn my lifelong hobby into a sustaining way of life and started Gibbons Rock Studio. Now I have the pleasure of devoting every day to creating beautiful portraits of the pets that are so special to all of us. To share ones life with any animal - whether a dog, cat, parrot or iguana - is such a source of joy and wonder. They are all unique and it is my goal to make that special connection that we have with our pets shine through in my drawings.